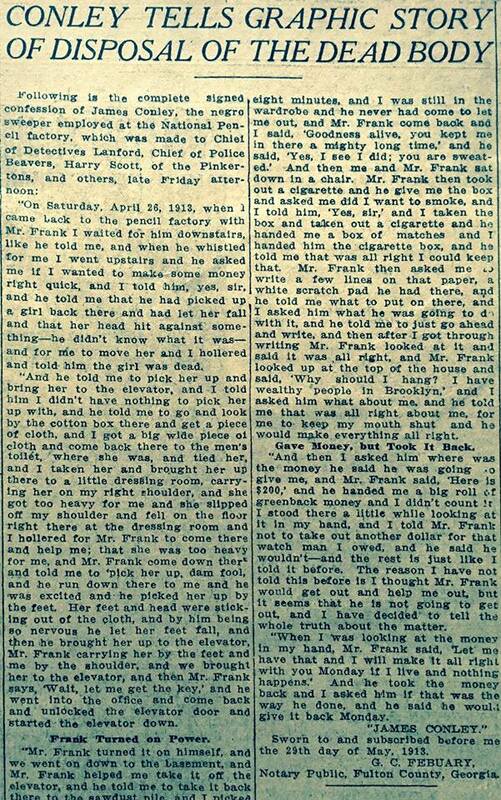 “On Saturday, April 26, 1913, when I came back to the pencil factory with Mr. Frank I waited for him downstairs, like he told me, and when he whistled for me I went upstairs and he asked me if I wanted to make some money right quick, and I told him, yes, sir, and he told me that he had picked up a girl back there and had let her fall and that her head hit against something—he didn’t know what it was—and for me to move her and I hollered and told him the girl was dead. “And he told me to pick her up and bring her to the elevator, and I told him I didn’t have nothing to pick her up with, and he told me to go and look by the cotton box there and get a piece of cloth, and I got a big wide piece of cloth and come back there to the men’s toilet, where she was, and tied her, and I taken her and brought her up there to a little dressing room, carrying her on my right shoulder, and she got too heavy for me and she slipped off my shoulder and fell on the floor right there at the dressing room and I hollered for Mr. Frank to come there and help me; that she was too heavy for me, and Mr. Frank come down there and told me to ‘pick her up, dam fool,’ and he run down there to me and he was excited and he picked her up by the feet. Her feet and head were sticking out of the cloth, and by him being so nervous he let her feet fall, and then he brought her up to the elevator, Mr. Frank carrying her by the feet and me by the shoulder, and we brought her to the elevator, and then Mr. Frank says, ‘Wait, let me get the key,’ and he went into the office and come back and unlocked the elevator door and started the elevator down. “Mr. Frank turned it on himself, and we went down to the basement, and Mr. Frank helped me to take it off the elevator, and he told me to take it back there to the sawdust pile, and I picked it up and put it on my shoulder again, and Mr. Frank he went up the ladder and watched the trapdoor to see if anybody was coming, and I taken her back there and taken the cloth from around her and taken her hat and shoes which I picked up upstairs right where her body was lying and brought them down and untied the cloth and brought them back and throwed them on the trashpile in front of the furnace and Mr. Frank was standing at the trapdoor. “He didn’t tell me where to put the thing. I laid her body down with her head toward the elevator, lying on her stomach, and the left side of her face was on the ground the right side of her body was up and both arms were laying down with her body by the side of her body. Mr. Frank joined me back of the elevator and he stepped on the elevator when it got to where he was and he said ‘Gee that was a tiresome job’ and I told him his job was not as tiresome as mine was because I had to tote it all the way from where she was lying to the dressing room and in the basement from the elevator to where I left her. “Then Mr. Frank hops off the elevator before it gets even with the second floor and he makes a stumble and he hits the floor and catches with both hands and he went around to the sink to wash his hands and I went and cut off the motor, and I stood and waited for Mr. Frank to come from around there washing his hands, and then we went on into the office, and Mr. Frank, he couldn’t hardly keep still. He was all the time moving about from one office to the other. Then he come back into the stenographer’s office and come back and told me, ‘Here come Emma Clark and Corinthia Hall,’ I understood him to say, and he come back and told me to come here, and he opened the wardrobe and told me to get in there, and I was so slow about going he told me to hurry up, damn it, and Mr. Frank, whoever that was come into the office, they didn’t stay so very long till Mr. Frank had gone about seven or eight minutes, and I was still in the wardrobe and he never come to let me out, and Mr. Frank come back and I said, ‘Goodness alive, you kept me in there a mighty long time,’ and he said, ‘Yes, I see I did; you are sweated.’ And then me and Mr. Frank sat down in a chair. Mr. Frank then took out a cigarette and he give me the box and asked me did I want to smoke, and I told him, ‘Yes, sir,’ and I taken the box and taken out a cigarette and he handed me a box of matches and I handed him the cigarette box, and he told me what to put on there, and I asked him what he was going to do with it, and he told me to just go ahead and write, and then after I got through writing Mr. Frank looked at it and said it was all right, and Mr. Frank looked up at the top of the house and said, ‘Why should I hang? I have wealthy people in Brooklyn,’ and I asked him what about me, and he told me that was all right about me, for me to keep my mouth shut and he would make everything all right. Gave Money, but Took It Back. “And then I asked him where was the money he said he was going to give me, and Mr. Frank said, ‘Here is $200,’ and he handed me a big roll of greenback money and I didn’t count it I stood there a little while looking at it in my hand, and I told Mr. Frank not to take out another dollar for that watch man I owed, and he said he wouldn’t—and the rest is just like I told it before. 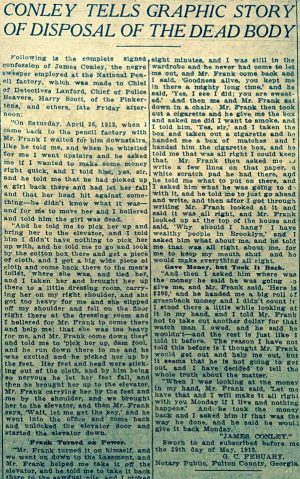 The reason I have not told this before is I thought Mr. Frank would get out and help me out, but it seems that he is not going to get out, and I have decided to tell the whole truth about the matter. “When I was looking at the money in my hand, Mr. Frank said, ‘Let me have that and I will make it all right with you Monday if I live and nothing happens.’ And he took the money back and I asked him if that was the way he done, and he said he would give it back Monday. Notary Public, Fulton County, Georgia.